Toss chicken strips in cumin and add chipotle peppers and their sauce to your favorite oil and vinegar dressing for a quick, Southwester salad dinner. 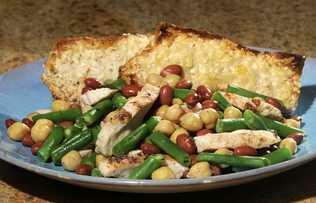 Toasted baguette with Parmesan cheese complements this delicious and unconventional chicken and three bean salad. Chipotle peppers in adobo sauce can be found in the grocery section of the supermarket. Chipotle Chili Pepper seasoning can be found in the spice section of the supermarket. It can be used as an alternative to the peppers in adobo sauce. If using the spice seasoning, add 2 teaspoons to the salad dressing. Slice baguette in half lengthwise and then in half horizontally to make four pieces. Sprinkle the inside with Parmesan cheese and place in toaster oven to melt cheese, about 2 minutes. Add chipotle pepper and adobo sauce to dressing and set aside. Toss chicken strips with cumin and set aside. Place green beans in a large microwave-safe bowl and microwave on high 2 minutes. Remove from microwave and add chicken, chickpeas, kidney beans and dressing. Toss well. Add salt and pepper to taste. Toss again. Serve with Parmesan baguette. Makes 2 servings. Buy trimmed green beans and cut them into 1-inch pieces. Toast baguette with cheese in a toaster oven or under a broiler. Use same bowl for microwaving green beans and making the salad. 06/23/15 - Join us for our June Topical Currents call-in edition with veterinarian Dr. Ian Kupke and animal behaviorist Edel Miedes. We’re “At Your Service” for questions Tuesday, especially about those loyal family members who can’t voice their concerns . . . pets. They need special attention when a storm approaches. Listen in . . . and phone in . . .
Dan Churchill Break out star of Master Chef Australia and Author of "Dude Food"
05/07/15 - 1:30 - Syndicated food columnist Linda Gassenheimer, Special wine correspondent Fred Tasker and WLRN hosts Joseph Cooper and Bonnie Berman interview TV celebrity, Ingrid Hoffmann.